Dress to impress with this stunning floor-length mermaid dress! 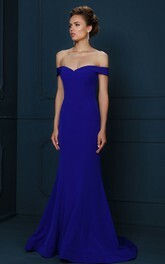 With its off-the-shoulder neckline and its form-fitting cut that widens at the bottom, you can count on getting that seductive Jessica Rabbit-meets-mermaid-Ariel look going. 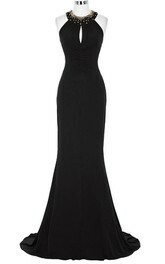 An ideal choice for proms, fancy formal events and, why not, the red carpet! Rock it with sass and confidence! I would like to thank the seller for such a quick shipping. The dress is so comfortable to wear. I am also thankful to the other buyers who posted reviews. They helped me decide purchasing this dress for me. The fabric is so soft and smooth. It offers the comfort I would desire to have for all day wearing. Overall, it is a steal deal for the price. I like the off-shoulder design a lot. Length is correct for my height. I wore it with heels at my prom and everybody liked my look so much.